What can the Phillies expect from John Mayberry, Jr. in 2012? That may be the biggest question as the Phillies approach Opening Day. Following a forgettable minor league career, Mayberry was impressive for the entire second half of 2011. Can he do it again in for the Phillies in 2012? Mayberry's 2011 stats are eerily similar to his minor league numbers in most areas, but 18 more homers and 35 more RBIs is quite a jump. How can a player do in one major league season what he couldn't do in over five minor league seasons? The answer might be as simple as a new batting stance. That's right, 55 home runs and 137 RBIs. Can a new batting stance really explain such a turnaround?! It’s actually not such a farfetched notion. John Mayberry is 6'6'', 230 lbs, and possesses a rare combination of power and speed. For an incredible athlete like that, it’s just a matter of finding a way to utilize his natural tools. The difference is small with a player like Michael Martinez, but the potential upside for Mayberry is enormous. Coming out of Stanford, the Rangers liked his potential so much that they drafted him 19th overall in the 2005 draft and tossed him a $1.525 million signing bonus. As phuturephillies.com pointed out, Baseball America considered Mayberry “a legitimate middle-of-the-order hitter,” but to correct his hitting flaws “may take him 1,500 at-bats in the minor leagues." It ended up taking him 2,656 at-bats. Let’s dive deeper into his stats to see what exactly he was doing that made him so successful. Here are how some of his advanced stats compare to the rest of the league. On paper, John Mayberry was a better player than Ryan Howard. Mayberry made more contact, struck out less, hit for a higher average, and overall he hit for more power. I’m not saying John Mayberry is better than Ryan Howard…at least not yet. But Mayberry has all the tools to become a serious threat in the middle of the Phillies lineup and now he has the stats to back it up. The main figure to focus on here is their similar OPS, which essentially measures their total production. Werth was able to translate his production totals into all-star caliber success in the everyday lineup and there is no reason to believe Mayberry can't follow suit. Werth's example may be the best to project big things in the future for Mayberry. Although his poor statistics in over five years in the minors is cause for concern, Mayberry's continued production for nearly half a season was not just lucky. When a player is lucky, you can normally point to a large spike in one area. That wasn't the case with Mayberry. His contact percentage, strikeout rate, home run rate, and extra base hit rate show that he consistently improved his game in many areas. Mayberry had the tools all along to be a superstar, but for whatever reason, it took him much longer than most to find his stroke. Now that he discovered the missing piece with his new batting stance, he has the opportunity to realize his full potential. That said, my projection is that Mayberry will be the Phillies' regular left-fielder at year's end. He will be a huge part of the Phillies lineup in 2012 and will hit around .270 with at least 25 homers and close to 100 RBI's. Prove me right, Big John. Why did you trade Wilson Valdez? That's my question for Ruben Amaro. Asking “what is going on with Chase Utley?” would also be a good question, but it is apparent with today’s press release that even Utley's doctors don’t know the answer to that one. I don’t expect a general manager to be a doctor or a fortune-teller, so blaming Ruben Amaro for Utley’s health is not fair. But Ruben Amaro didn’t need to be a doctor or a fortune-teller to know that trading Wilson Valdez was a big risk. At the time of the trade, Ruben was well aware that he had an old infield. He knew that his first baseman would be out until at least June. He knew that his third baseman missed 40 games and had two surgeries during the off season. He knew that over the last two seasons his shortstop missed 94 games and his second baseman missed 106 games. Amaro also knew that his second baseman had a chronic knee condition. The key word being chronic, meaning it will never go away. In Utley’s situation, they could only hope to manage the pain and try to keep him on the field most of the time. And that’s a best-case scenario. The Phillies had only two options. Option #1 was Freddy Galvis. The Phillies publicly stated Galvis was not Major League ready as a hitter and needed more time in the minors…as a shortstop. Option #2 was Michael Martinez, who hit all of .196 last year. Ty Wigginton can play second base, but he can't play shortstop and with all the aforementioned injury problems he will be plenty busy at first base, left field, and third base. That brings us to today's announcement that Utley will not be ready by Opening Day and possibly much longer. The Phillies, who have been starting Galvis at second base exclusively over the last week, will likely name him their starting second baseman and Martinez will be the main utility infielder. The Phillies are in a bad situation for two reasons. First, they are bringing up Galvis before he is ready. Secondly, the Phils will replace Valdez' .249 average with Martinez' .196, a tradeoff of 53 points. Amaro dealt Valdez to save some cash, which is understandable. The Phillies are right up against the luxury tax and need to cut costs somewhere. In that regard, Michael Martinez at $480,000 looks a lot nicer than Valdez at $930,000. But saving nearly half a million dollars was just not worth the risk. Ruben Amaro took an area of strength and made it an area of weakness. We will see just how much that costs the team soon enough. The 2008 Phillies finished 3rd in runs and 1st in home runs. Charlie Manuel loves the long ball and that was Charlie’s type of team. Hitting led the way and pitching followed. Times sure have changed, as the 2011 Phillies finished 7th in runs and 8th in homers. Injuries to Howard and Utley will push those rankings down even further. In just four years, the Phillies have transformed from an offensive juggernaut to a pitching machine. With injuries to their #3 and #4 hitters, the Phillies offense may struggle just to reach the middle of the pack. Charlie Manuel is not a “small ball” type of manager, but with his power bats gone he better be a quick study. The average home run totals among the Phillies “regular” lineup (Rollins, Ruiz, Polanco, Mayberry, Victorino, Pence, Galvis, Wigginton) is just 16. Not exactly a frightening lineup. In the past, Charlie Manuel opted to swing away when given the chance, rarely attempted hit-and-runs, and wasn't a big fan of bunting. It was a fine approach when power hitters filled the lineup, but it doesn't work on a team whose best power hitter averages just 25 homers per season (Pence) and only one other player averages above 20 (Wigginton). The Phillies must find ways to manufacture runs. Charlie has the tools on his roster to play small ball. One way to do that is through hit-and-runs. The Phillies have enough speed with Victorino and Rollins and to some extent Mayberry and Pence. Placido Polanco makes extremely high contact and is perfectly suited for hit-and-runs, while Ruiz and Rollins handle the bat well enough to execute the task. But the key ingredient to manufacturing runs is playing fundamental baseball, and I'm not sure Charlie can make it happen. 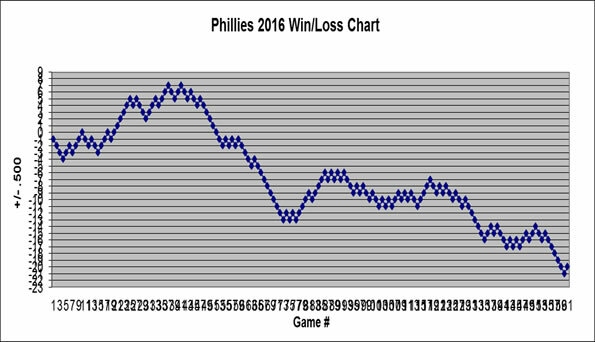 The Phillies have been poor in the past at sacrifice bunts, moving runners over, and scoring with a runner on third and less than two outs. Rollins and Victorino all too often swing for the fences and hit a pop-up rather than taking the "free" run with a groundout to shortstop or a sac fly. It is ultimately up to the manager for a patient, disciplined approach at the plate, making this Charlie Manuel's toughest test yet. It is crucial for him to emphasize the fundamentals during the last couple weeks of Spring Training. Can he get his players to hop on board? Does he believe in a small ball approach? Are the Phillies even capable? The answers to those questions may decide the Phillies fate. Opening Day is exactly one week away for the Phillies, so it is time now for our 2012 Phillies predictions. For the fourth straight year, I will go through each of the Phillies starting positions and give you my predictions. For the first time, though, you won't see a predictions for Ryan Howard or Chase Utley...ugh. Before we get to the hitting let's begin with the starting pitching. It could be a real struggle for the Phils to score runs this season, but I've got three words for you: Halladay, Hamels, and Lee. If the Giants can win a World Series in 2010 with an offense that ranked dead last, the Phillies have more than enough offense to provide for the three studs at the top. Halladay was an absolute work horse last season and an ace in every sense of the word, actually improving his ERA over his Cy Young season in 2011. Halladay is still one of the best pitchers in all of baseball, but he is not getting any younger. Halladay might start to show signs of a decline and his numbers may be just slightly worse than last year. Regardless, he's still my Game 7 starter. Cliff Lee gave the Phillies their money's worth in the first year of his huge contract with nearly identical numbers to Doc Halladay. However, Lee was inconsistent with several bad outings followed by moments of brilliance. I think Lee's ERA might be a bit higher as teams have seen him a few times, but I expect a much more consistent season from him. As I mentioned in a previous article, Cole Hamels is my pick to win the Cy Young award. Last year was Cole's best season of his career and I think he will be even better in 2012. Hamels has well over a year of experience with his cutter, showed his maturity as a pitcher, and says he feels even healthier entering 2012. And, oh yeah, it's a contract year. Lots of eyes will be focused on Vance Worley this season. Will he fall prey to the sophomore slump? I don't think so. As I wrote earlier, I think Worley is going to have a solid season. Worley will not be as good as his ERA in his first 11 starts, but he also won't be as bad as his 4.17 ERA in his final 12 games. Even while his ERA was rising in the second half, Vance was fairly consistent throughout the year in many areas. He's not an overpowering pitcher and doesn't have terrific movement, but he throws strikes and thrives under pressure. With a full year of tape on Worley, hitters won't be taking so many called third strikes, but I think Worley will make the necessary adjustments. Look forward to a fun year with Vance Worley. Everyone seems to be down on Joe Blanton, but I think he will rebound just fine from his injuries last year and will return to his normal form. Blanton will not be worth his salary, but I will take him as my number five starter any day. The book on Blanton throughout his career is that he won't dazzle you, but keeps his team in the game. Joe will do the same thing in 2012 with an ERA in the mid four range. Next up: predictions for the offense.